It is Christmas Season and it is time for us all to celebrate. This month, Termite Terry Pest Control would like to thank all our customers by holding a special Christmas drawing. 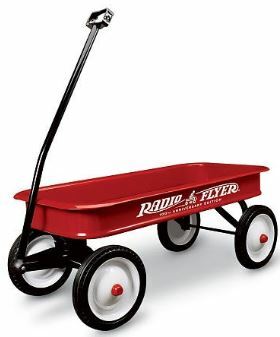 This year, Radio Flyer has come out with their special 100th Anniversary Edition of this classic wagon, and we would like to give our clients a chance to win their very own. This special edition has a red steel body, is almost 40 inches long, 18 inches wide, has ten inch wheels, and has the “100th Anniversary logos on the sides. 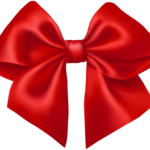 All entries must be received by December 21, 2017. To enter, simply open your newsletter to find your entry form, and fill in the needed information. You can either send it back to us via email, fax, or by mail. The drawing will take place at our office on December 22, 2017, at 10am. 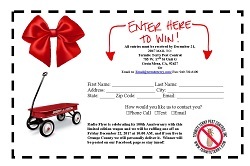 And, if the winner lives in the Orange County area, we will personally deliver the wagon that day! The winner will be posted on our Facebook Page. Don’t be late, send you entry in TODAY! * Employees of Termite Terry Pest Control, Inc. and their immediate families are not eligible for entry. Termite Terry and his staff!